Southern Fried L'Attitudes: LulaRoe Party, Shopping, and Other Saturday Adventures! 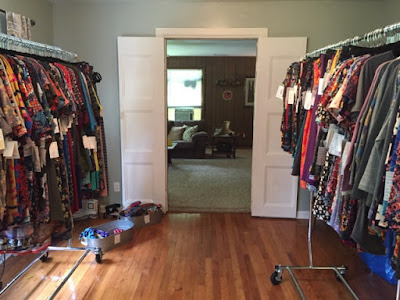 LulaRoe Party, Shopping, and Other Saturday Adventures! Had a few hours Saturday morning to delight myself in making the house look better. 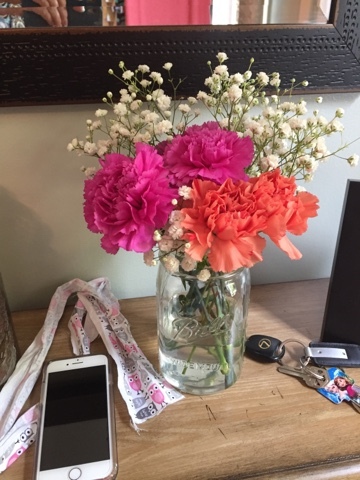 I began laundry and moved forward into the cleaning the kitchen, skipping the ironing completely as I knew it would take a long time. 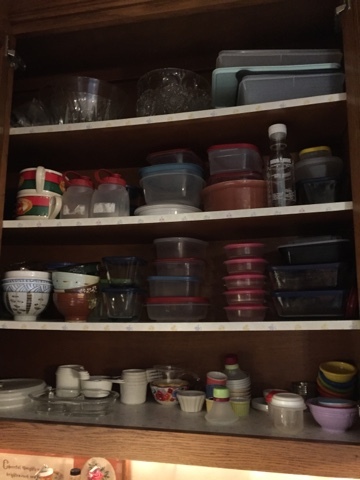 As I put up the dishes, I became annoyed at the order (lack of) the cabinet that housed our tupperware/rubbermaid or sandwich meat-turned-tupperware dishes. So I set out to make it in order with matching tops. I have to get the fold up kitchen step ladder out to do this. But it does look better don't you think. Now no one has to hunt on tippy toes for the top to anything! Do we have enough bowls for any occasion? Any size? You should see the other cabinets. lol And the glass cabinet is unbelievable. It desperately needs to be redone but I don't have the time/patience for it right now. I laid out some of the ingredients for my soup with the lamb meat in it. I will be making that today. I chopped up a cucumber and marinated them in vinegar and water. 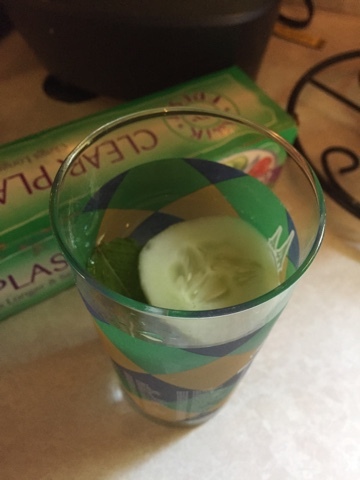 And made me some water with mint and cucumber. Would have added a lemon but George used the lemon I bought for water - on some other dish. Sonya gets idea, buys ingredient item to fix XYZ for ABC dish. George sees new ingredient item in fridge and thinks "hmmm an XYZ in the fridge, what can I do with this?" And comes up with own idea to use XYZ. Sonya comes along to slice XYZ for ABC dish and tears apart fridge looking for XYZ for ABC dish only to discover the XYZ is long gone. But that is ok. I'm sure whatever dish he cooked with the XYZ was excellent. But perhaps some kitchen stickers and permanent markers are in order. We are supposed to be "help meets" or "help mates" to one another right? But I promise (only word I can think of instead of I swear, besides I Suwanee), that we cause each other more infliction than help sometimes. lol lol lol And as I type this I think of the vent that used to be in the hallway floor at the old house. George takes the vent up and pulls out the filter and leaves a hole in the floor - goes off to do something (perhaps take filter outside and get new one). I come along with laundry in arms down the hallway I tread tens of thousands of times and land in the hole and nearly break my leg. No warning - no nothing - just fell into a hallway hole out of the blue. He said "you should have seen it". I said "you should have warned me". Well no I didn't see it with a load of laundry in my arms and not looking down. There usually is not a hole in my hallway floor! lol If it hadn't hurt so bad it would be funny. And that makes me think of the time that George stuck his leg through the ceiling from the attic. However, that was different. I didn't set that trap - he did that own his own. It was a new house (well new to us) and he stepped in a part of the attic that didn't have flooring to it and his foot went through it. It scared me but I saw that he was ok and I think I said "what are you doing?" which was akin to "why in the heck is your foot dangling from the ceiling?" (lol) He took offense at my response because he said my response should have been "Are you ok?" instead of me worrying about the ceiling. Ok so maybe. But I saw he was ok - so I didn't ask that. Well, anyway I'm off on a tangent now so let me get back on task. At noon I left to go to my daughter Katy's house for a LuLaRoe party. I stopped to get ice. And headed on to see Katy and gave her a couple of souvenirs from our trip and gave her Cody's. He was working yesterday. Here is the pretty spread Katy had on the table. I grazed. Who doesn't like to sip wine and shop (and graze). lol What a perfect place to set up shop. Well I had a lot to learn about LuLaRoe. And found out that I really like it and they absolutely had things that would fit ME TOO! I ended up buying 3 pieces. They are cute and fitting and comfortable and I really like it. Was quite surprised. I bought Katy one item also. The pieces are unique. Only so many items made with the same print. You cannot pick a size and a print and ask for that in YOUR size. You simply pick from what is there. That was odd at first, but then I realized that actually made it fun. What you don't like, someone else does. But I did have 3 that I liked. When the consultant orders her pieces, she can order the size and the style but has no idea what kind of print it will be. 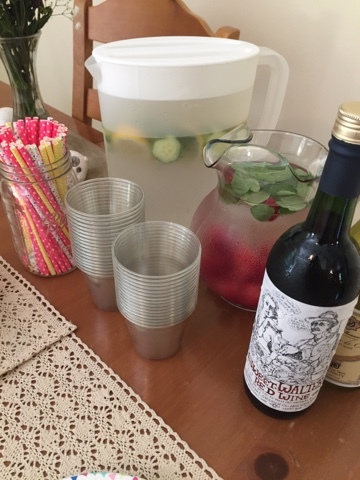 The consultant does Pop-Up parties, sells from her home, from Facebook and Instagram. Very intriguing. If I were a stay-at-home Mom, I would consider making the investment $4800 to $6000 and selling it myself, lol. However, at my age, I'm not sure I'd be too good at hauling clothes and setting up pop up shop parties all over town, but the business does sound exciting. Wish I had known about it a long time ago. However, I sit here thinking if I were to do this I would want to be able to show Plus Size women that there ARE clothes available to them and that they are comfy and pretty. Hmmm. I have the space for it downstairs. Hmmm. I just don't have the time though. But I am in love with the idea and the designs and the products and the whole prospect of it all. Am also wondering how the "business thing" would help one with their "taxes". One thing about it is there is NO presentation. The clothes sell themselves. Katy is having another party in the fall. I think I will want my Mom to go! The four items (3 for me and one for Katy) cost me $200 even. The items are pricey but of excellent quality and should last a very long time. Since I spent that much, I am declining on my adventure to do the Advocare challenge - for now anyway. However, I'll try to do something similar on my own. Or delay it for a while. Give and take I guess. I just ordered a Walmart order and a few things from Amazon. I really need some more sandals so I can try to move from "cutesty flip flops" to a more professional look for work. I'll be moving into a more professional environment that is cleaner and in a much nicer part of town so the desire to match the decor is there. Right now I work in a place where there are bars on the windows, the floors are scratched up and dirty, the walls need painting/cleaning, the bathrooms need a lot of TLC, so I have really not desired to dress up much there. I mean it IS a manufacturing environment, so....that is the way it sometimes is. But with being in a nicer place, you want to match the environment you know, so I'm in the market for some better pieces. My summer dress blouses are also wearing out so I do need to try to keep adding a few pieces here and there. But....I don't need to spend a lot of money at once either. I will do a little each weekend maybe so it won't be so noticeable. However, dropping $200 was noticeable. lol But you can't shop anywhere nowadays without spending that much on a few pieces. Plus we did not spend on vacation on shopping what we normally do. Vacation is normally where I find some clothes to wear, but not so much this time. 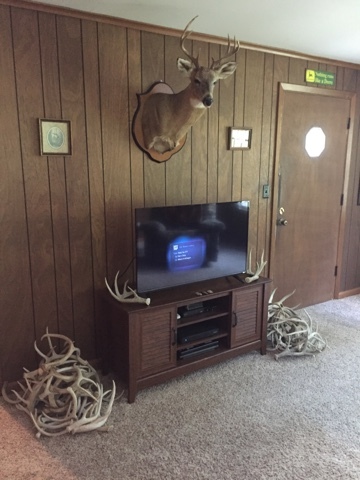 Well, here is Cody's Mancave wall with the deer and the antlers piled on each side of the TV. Cute! Well, the party was over at 4 and I left to head back home. George fixed a fine meal of BBQ chicken and "red" grits and a salad. I had to save the salad for today - just couldn't eat that much. I guess that is a good thing - or bad - b/c I did graze quiet a bit at Kate's being some of it was food I shouldn't eat - dips and chips and cheese. ;-) But I loved every minute and every bite. Well when I went to bed last night the Preds were winning. And they did win the game. I had to look at my phone in the middle of the night to make sure there wasn't an upset in the game. George was well asleep by then. So once I saw they won, I could sleep. You know I'm not a sports fan but I do want them to win, lol. I kept my eye on the game the first two quarters, but read in my Rod Stewart Autobiography book until fmy eyes were so sleepy and I began to nod off. Roger itched again last night and George put the apple cider vinegar on him. Well, I'm about to start my day. I want to fix up my soup and also food for some lunches. Ya'll have a wonderful day. I'm happy to have the day at home to do whatever the heck I WANT - even if it is cooking and cleaning. I love being home! part of town and a cleaner workplace. Ok, it's time for me to start prepping for BLT night. 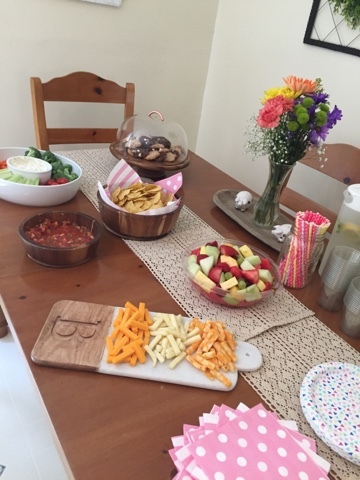 The LuLaRoe party spread looked nice. Glad you found some pieces you liked. A shame you lost your lemon to one of your husbands recipes. I'm just now reading about the party and it does sound like a great way to do some shopping. Glad you found some things to buy. You and your hubby sound like a hoot! I could not help but laugh. I would never look down walking in the hall either. I'm glad you did not break a leg. The party sounds fun. I have never been but have seen the clothes. I use to have all kinds of parties. Tupperware , princess house, makeup. You name it I got talked into selling it. I spent my profit on buying new products! But it was fun. I love getting a group of women together for food and fun. Weird Mood but Kinda Like It!